The Writing on the Cow: Cute Animal Inscriptions for Springtime! We’re feeling full of the joys of spring today, so it seemed a good time to hunt for some of our favourite spring-themed inscriptions… And when I say spring-themed, yes, I’m talking cute animals! 1. A Late Bronze Age clay cow figurine with a Cypro-Minoan inscription on its side and a pattern of cross-hatching on its forehead. Image courtesy of Silvia Ferrara. Cypro-Minoan is a syllabic script of ancient Cyprus (in use between the 16th and 10th centuries BC), related to Linear A and Linear B. It is undeciphered, so unfortunately we do not know what the short text on the side of this cow says. This is the only example of a Cypriot clay figurine with an inscription, but Cypro-Minoan texts are found on a wide variety of different objects. Linear B – Alive and Well! 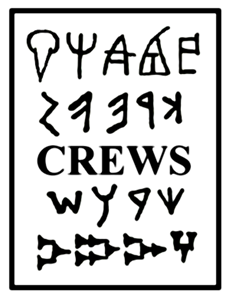 I have already talked about Linear B a little bit on this blog, for example in the post explaining the first line of the CREWS logo HERE. It was a syllabic writing system, used by the Mycenaean palaces in ancient Greece during the 15th-13th centuries BC, and its surviving inscriptions are predominantly detailed economic records of the palatial centres. We know that within the palatial centres, the central administration was maintaining close control of a wide range of commodities and personnel through written records (see Figure 1 for a record of sheep, for example). Strikingly, these methods of administration were virtually identical at each of the palaces across Crete and mainland Greece – despite being hundreds of miles apart and sometimes also chronologically distant from each other (e.g. the palace at Knossos on Crete was destroyed perhaps as much as 200 years before the mainland palaces). Figure 1. Mycenaean clay tablet from Knossos, Crete, written in the syllabic Linear B writing system. It is a bureaucratic document recording numbers of sheep. Copyright: Trustees of the British Museum, no. 1910,0423.2. Now there isn’t time in this post to talk through the details of the Mycenaean economy, although it’s something of a favourite topic of mine and I am sure we will return to it some day. After all, the economic context in which Linear B was used is key to understanding the use and development of writing in this period – putting the Context into Contexts of and Relations between Early Writing Systems. But the real reason for this post was to highlight some wonderful work by my colleague Anna Judson, who has created an ingenious boardgame called Mycenopoly. The game uses Mycenaean sites and concepts – and, delightfully, all the text is written in Linear B. Which just shows you that Linear B is alive and well, over 3,000 years later, and that there is much more you can do with ancient writing systems than just studying them in the abstract! Figure 2. Anna Judson’s Mycenopoly. You can read more about Mycenopoly on Anna’s blog HERE, and we will return to the CREWS logo and the Venetic alphabet, as promised, sometime soon.